Live monitoring is a feature allowing administrators to watch emails as they arrive in the system. It provides a very efficient and easy method of troubleshooting incoming, as well as outgoing messages in Xeams. Live Monitor uses Java Scripts to pull fresh data from the server. Most modern browsers, including mobile devices such as iPhone, iPad, Android phones and tablets support Java Scripts and therefore, it can be viewed on them. 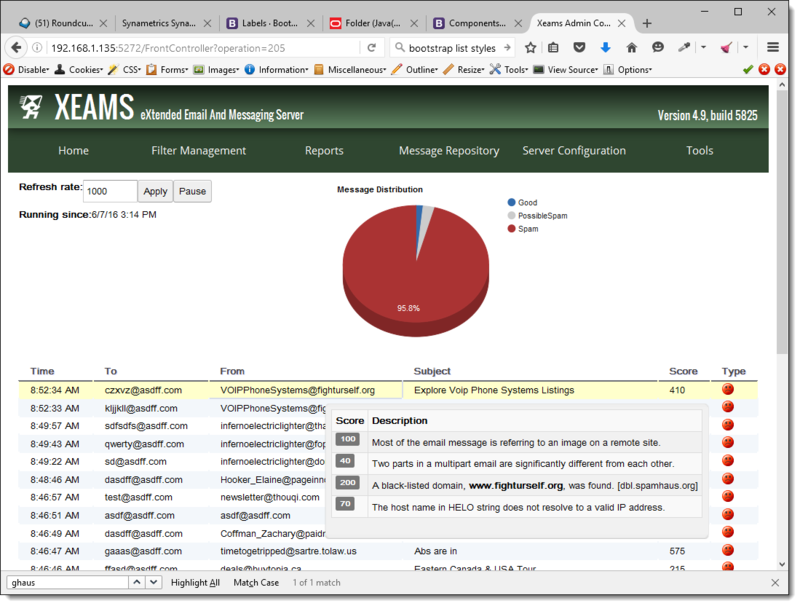 When live monitoring is on, Xeams server will send the subject, message type and filtering reason to your client browser as messages come in. Additionally, it will also display the reason for junk when a row is clicked by mouse. I don't see whether it is possible to increase the entries on the live monitor?